Post subject: What a beauty! I caught this little fish on my last trip to malvalli. A perfect morning with strikes coming at regular intervals and this fish whacked my spinner and headed for a clump of submerged roots. It was a thrill to see it dart after my spinner and grab it. Did you take it on a Mepps pattern spinner ? Anyone have luck on Toby's for Masheer ? By the way, is it possible to get membership to fish the stretch in malvalli ? Post subject: Re: What a beauty! 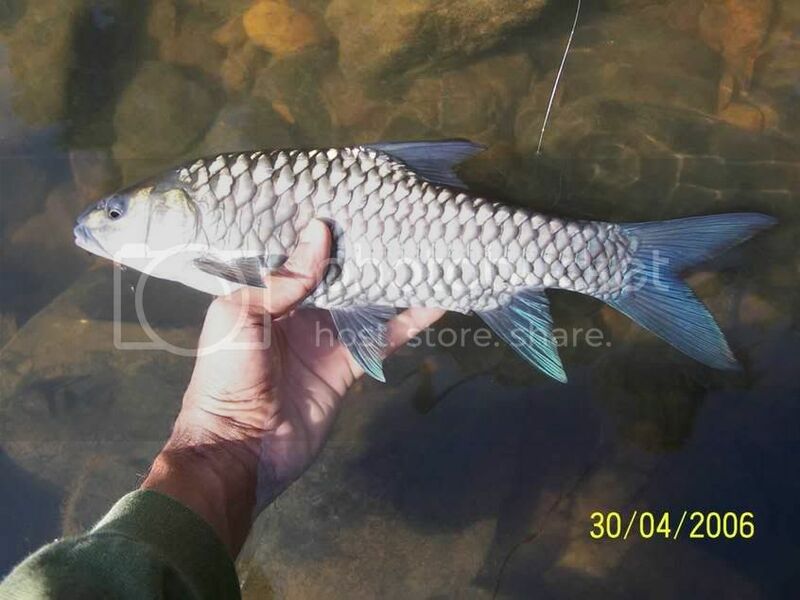 I will remember this fish for my life time as this was the first Mahseer I saw. That fishing trip really got me totally into this sport. I still remember the actions I had on that trip. She's a beauty...what a fish!! Caught that fish on a no.4 french blade (Mepps Pattern). Silver blade with a gamakatsu treble. I have some Toby's but have never wet them. I got my membership about 3 years ago. Apparently they've stopped issuing membership to people who aren't residents of malvalli. I'll get the numbers for you so you can give them a call. Bops/Belli/Dhanu should be more up to date regarding CWS. I remember that trip as well. Towards the end you really started pulling them out and remember the big chap that followed your spinner upto your feet! 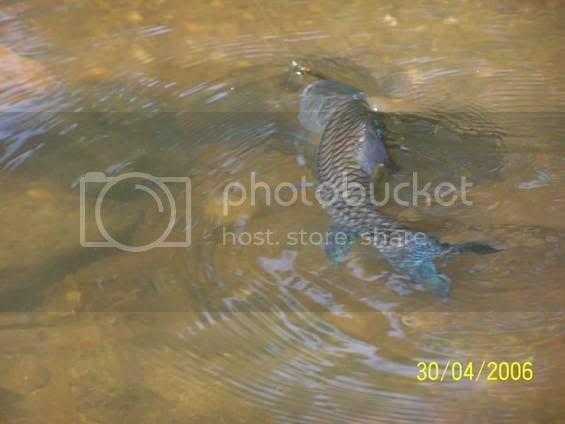 Are the blue fins indigenous to the Cauvery? What are the other types? They are found all over the Cauvery. I've caught them in malvalli and on the Galibori stretch. This is a little Golden chap from Croc Rocks using ragi. Another little chap from malvalli caught on spinner. I guess the colours are more saturated/magnified on smaller fish. 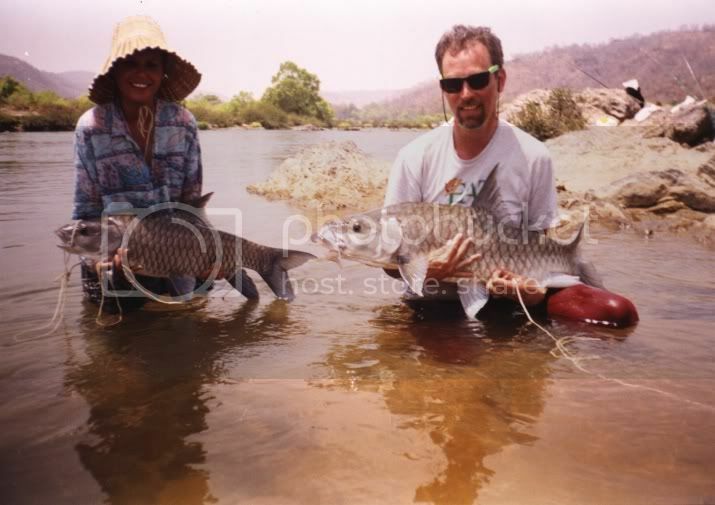 I had one of a small black (really black) mahseer as well which I can't find. 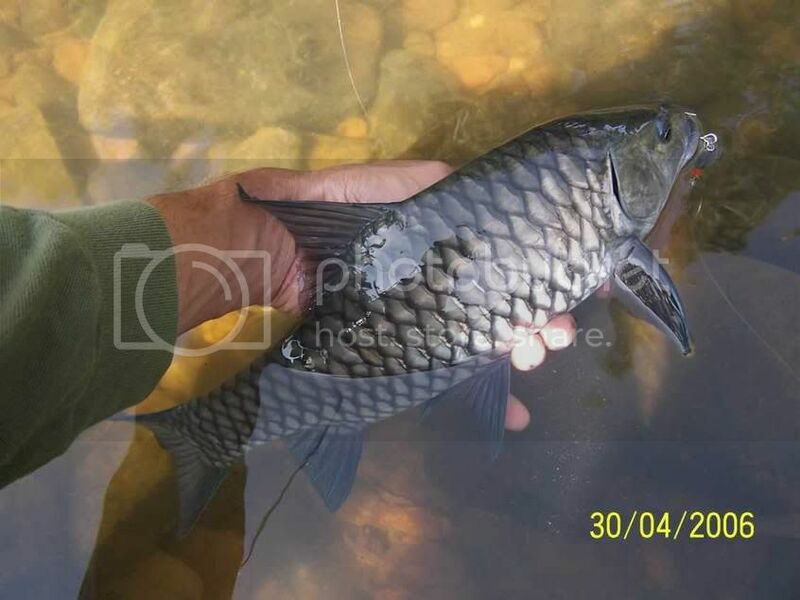 Never saw a Mahseer of that size again, also just can't get over the walk we had for a local soft drink after Belli caught this small fellow. 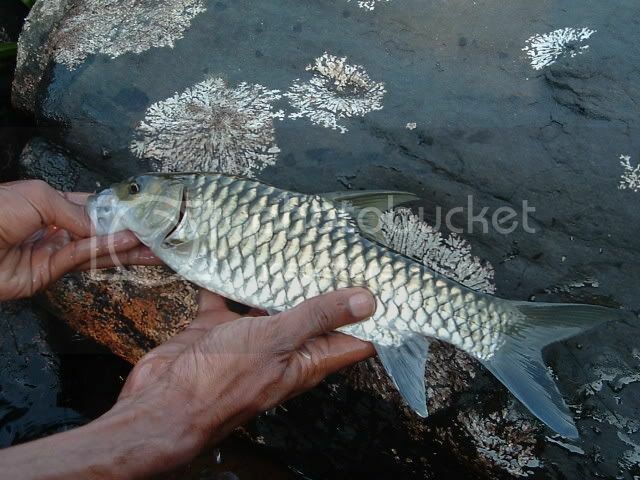 Super pictures, the the closeup of the silver mahseer, there is a rock at the back with some white growth on it. Does anyone know what that growth is? The last update I received from the malvalli Wildlife Society was that memberships were being given only to Coorgs owning property in malvalli. This was implemented recently. However guest charges are very minimal so you could team up with any of the old members for a trip. Something happened yesterday evening, more of which on another thread and I hope to have my own mahseer pics in the future. 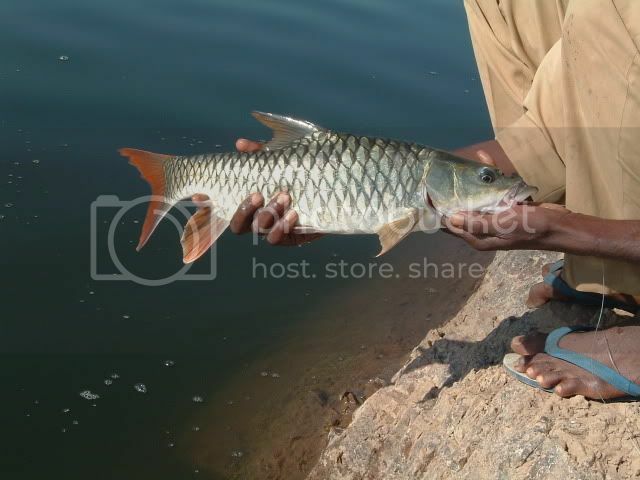 several times you were discussing the blue fin mahseer variety in the Cauvery. I didn’t have such nice looking catches by myself, but have an idea why they’re showing up now. Some time ago I popped into some scientific stuff about artificial breeding of mahseer. It was about Tata and other sources for fingerlings. They managed to interbreed several varieties and maybe –assuming that WASI is purchasing the stockfish from these sources- the blue fin mahseer could be such a mixture of different mahseer. I can’t remember if these fish themselves can breed successfully, but personally I don’t have too good feelings about. Here in Germany fishing clubs nowadays take care that at least their trout streams get stocked with the original strains. They now try to avoid out rainbow trout and other formerly non-existent species. I think also for the Cauvery and other Indian waters it should be the best to stick to the original species or strains. The blue fin used to be talked about as common in the Bhavani river system. I too have been having similar thoughts that they could have been introduced into the Kaveri. Thanks Bops, that's good to know. Anyone seen the Moyar Gorge ? I have heard that it is awesome, with some great fish and wild life. Pity it is out of bounds. Two from a mornings fishing. Both different !